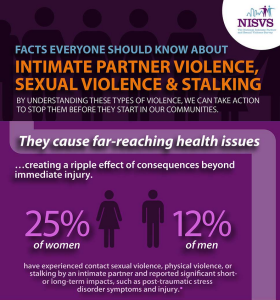 Today, the CDC released a new data set for the Prevalence and Characteristics of Sexual Violence, Stalking, and Intimate Partner Violence Victimization – National Intimate Partner and Sexual Violence Survey for 2011. The new report contains similar findings to the previous NISVS data sets, which suggests that the survey’s measures are reliable.This information highlights the prevalence of sexual violence and is critical as we continue our sexual violence prevention efforts. Nearly 1 in 5 women (19%) and 1 in 59 men (nearly 2%) in the U.S. have been raped at some time in their lives. One in 5 women (22%) and 1 in 7 men (14%) reported experiencing severe physical violence by an intimate partner in their lifetime. One in 7 women (15%) and 1 in 18 men (6%) have experienced stalking victimization during their lifetime in which they felt very fearful or believed that they or someone close to them would be harmed or killed. Much of stalking victimization was facilitated by technology (i.e., unwanted phone calls and text messages). Among women who have been raped and men who have been made to penetrate a perpetrator, 4 in 10 women (40%) and 1 in 5 men (21%) first experienced that type of victimization before age 18, and 4 in 5 women (79%) and 7 in 10 men (71%) were first victimized before age 25. Findings from this report can be used to help demonstrate that sexual violence, intimate partner violence, and stalking create a considerable public health burden, and can help identify priority target populations for prevention. Specifically, the data confirms the importance of efforts that focus on preventing these types of violence against young people.